Pick you up from your hotel, transfer to the airport and fly to Guilin. Upon your arrival, be greeted by Guilin local tour guide, transfer to the hotel and have a lunch. Drive to the Elephant Trunk Hill to start the tour in Guilin. The hill has 316 million years history and is Guilin city’s best known sight. Like elephant leisurely sucking water from the river with its long trunk, it got the name. Then visit the Reed Flute Cave. Various stalactites, stalagmites, stone pillars and other rock formations display a myriad of fanciful shapes, such as birds, flowers, curtains, and animals. Under the artificial lighting, you feel in a paradise where the Gods live. Enjoy a Li River Cruise. Li River scenic area is world reputed for its unique natural sceneries with the most beautiful karst mountains, clear water and a taste of life far removed from the concrete metropolis. Arrive at Yangshuo county, famous for the beautiful idyllic scenery. Take a biking tour around, visiting the two premier Yangshuo attractions-Moon Mountain,named for the lunar-shaped cavity in the center, and Big Banyan Tree, more than 1,000 years old,17 meters high, with a green umbrella-like round tree crown. After breakfast, drive to another typical county of Guilin-Longsheng, known for its minority culture. Visit Zhuang and Yao Ethnic Tribes and Longji Terraced Field there.The different minority customs and local people’s dressing style are specially delicate and beautiful. The terrace is a rice field built on the hillsides, looking like great chains or ribbons as they wind from the foot to the top of the hill. Leave for the airport and fly back to Shanghai. Upon arrival, Shanghai airport to your hotel transfer. I want to organize a 3 day tour to Guilin from Shanghai. We are planing to leave Shanghai on the 2nd of June and the leave Guilin on the 4th or 5th of June where we will be heading to Hong-Kong. There will be four of us. 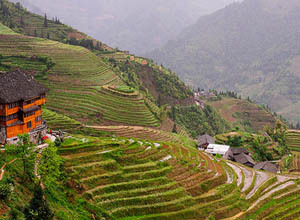 Is it possible for you to send me a price list of a 3 day trip to Guilin for 4 people please. I want to organize a 3 day tour to Guilin from Shanghai for two persons. We are visitings friends and living in there Apartment. So we plan a 3 day trip to Gulin during the 18th of April 2015 until the 28th of April 2015! Is it possible for you to send me a price list of a 3 day trip to Guilin.